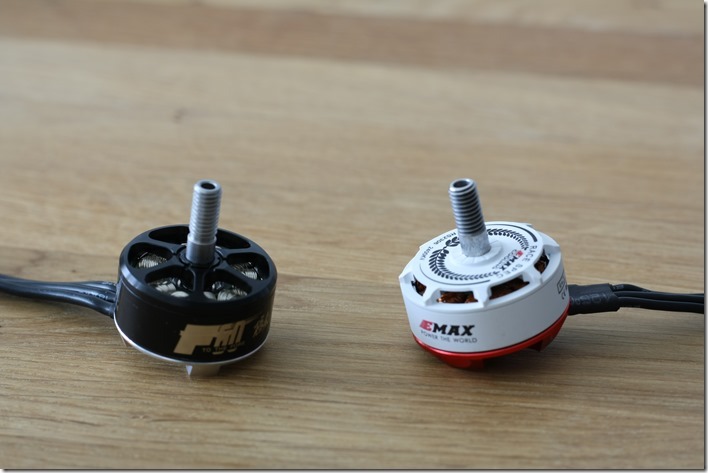 The T-Motor F60 Pro and the EMAX RS2306 are two of the favourites motors for FPV racing at the moment. Even thought the motors have different stators, we decided to compare them so you can pick the best one for your next FPV racer. We will first start with some details about the motors, then compare the build quality and finally check the thrust results from both motors. Both motors have very similar dimensions. However the propeller shaft of the the EMAX RS2306 is 1mm shorter. 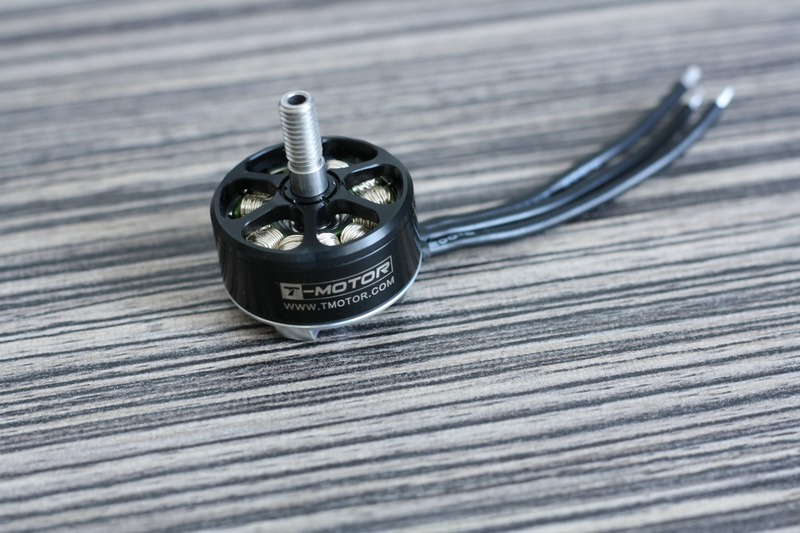 T-Motor is the heavier one – about 2.5g more. The motor cables are also different in size and length: T-Motor is using 60mm long 18AWG wires, while EMAX is using 75mm long 20AWG wires. T-Motor was always the leader for best quality motors and the F60 Pro is no exception. 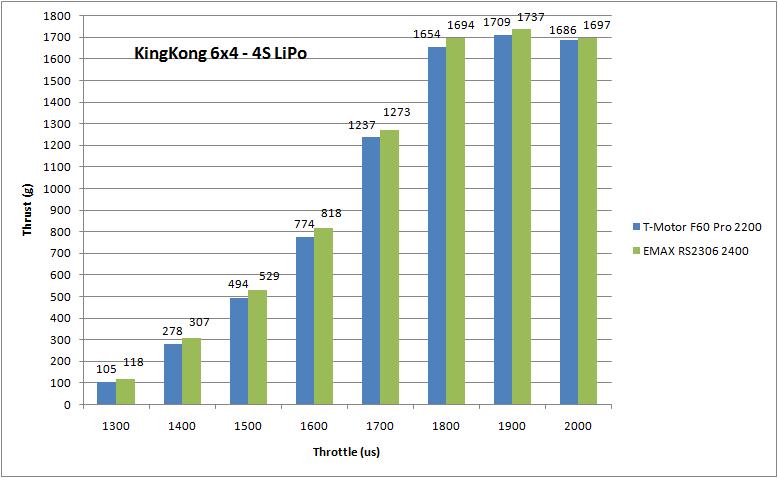 The motor is not so smooth as the F80 and LDPower FR2305, that we have reviewed in the past, but still perfectly fine. Personally we don´t find any difference with the smoothness of the RS2306 motor. EMAX build quality is also great and we can´t find any drawbacks. 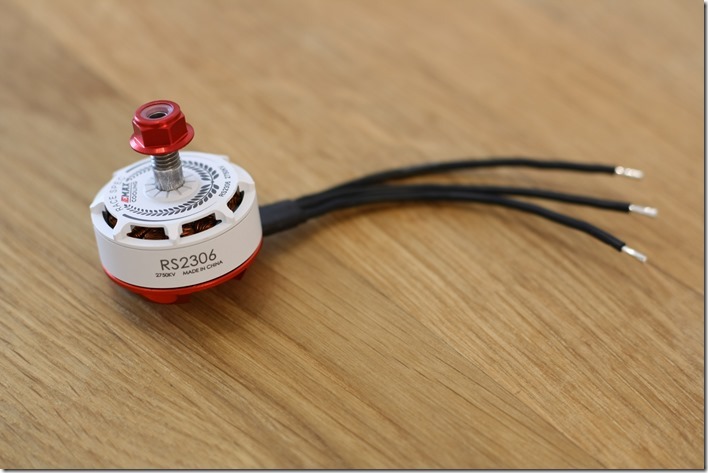 The RS2306 has much better build quality compared to its predecessor – the popular RS2205. Both T-Motor and EMAX are using arc magnets, to reduce the stator size of the motor. T-Motor is using silver coated wires for the motor windings, which should reduce resistance and heat. 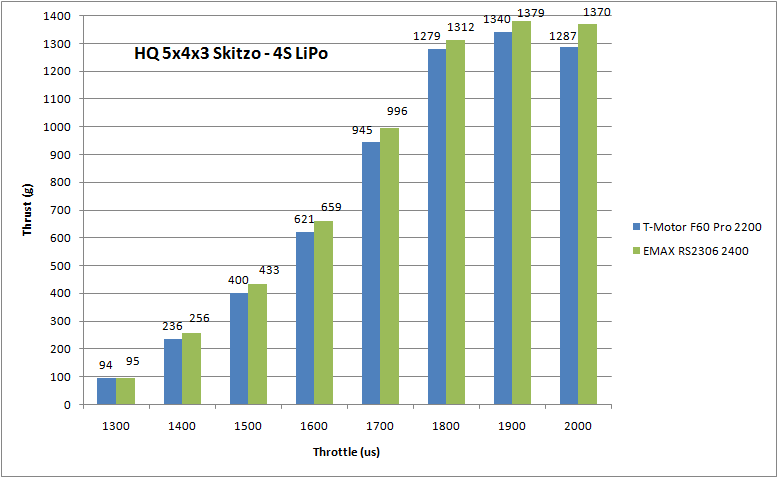 The following results and comparison in no way indicate which motor is better. Both have different stator sizes and different KV. We are using our best performing Aikon SEMF 30A ESC, various type of propellers and 1200W power supply. 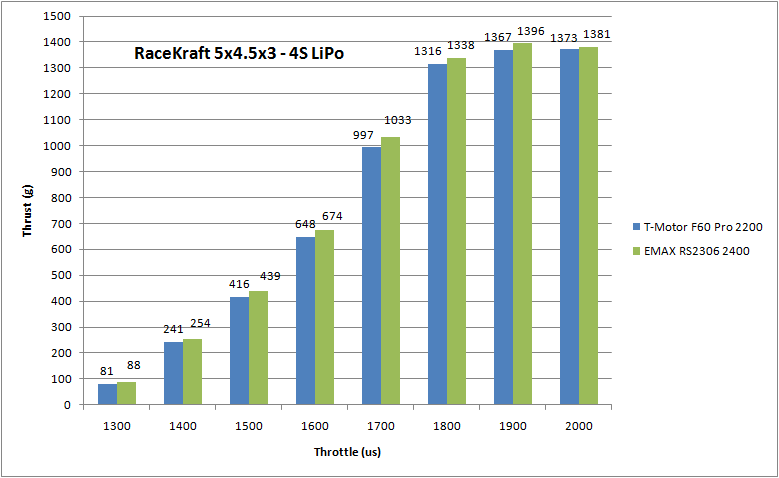 Below you will find a graph of the thrust comparison as well as the full exported Excel results. 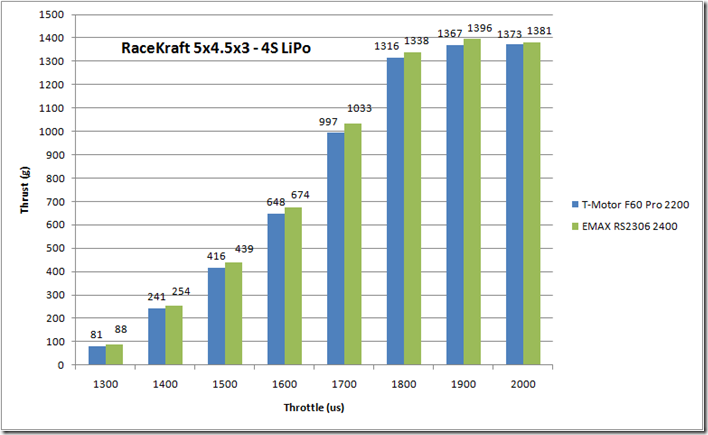 The 2400kv EMAX motor is providing between 10-30g more thrust than the 2200kv F60 Pro. 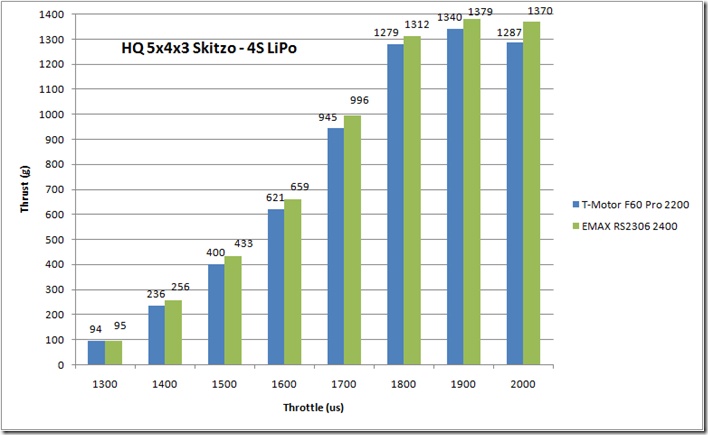 Additionally you can find the results of the EMAX RS2306 2750kv. 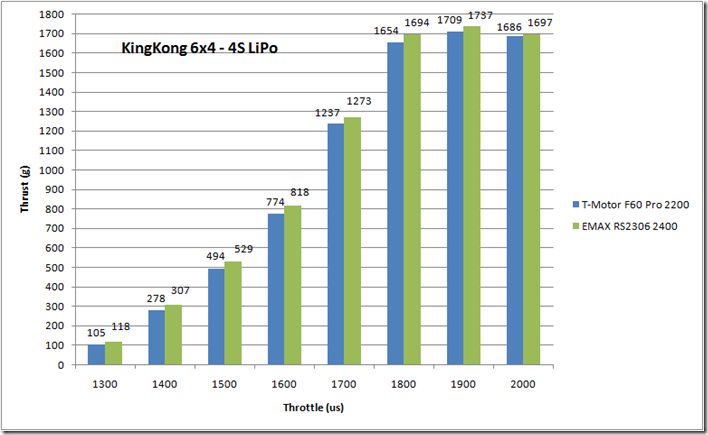 Both motors have very good build quality., so it is up to you, using the provided test results, to find out which motor and kV-version will fit best to your next FPV drone. 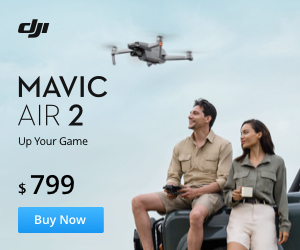 All versions of the F60 Pro are available here and EMAX as 4-pack here. If you like our articles, follow us on Facebook and Instagram and stay tuned!